The Recombiner Machine is specialized to create a narrow web or a wide web diffraction pattern shims for embossing. The Nickel embosses out pulsed energy into thermoplastic surface and that actually enables replication of the surface relief holographic and diffraction with high fidelity. The benefit of recombiner machines are that it is available as a stand along unit or one may also avail it in combination with holographic origination with production equipments. Moreover, it is comparatively cheap an does not have a high maintenance fee. Some of the features of a recombiner machine includes chilling system, heating system with power consumption of 5KW. The well equipped machine have a accuracy of resolution that ranges from +50 to -50 micron. The machines are also equipped with a micro controller based Temperature Controller that controls the electrical heater. The Recombine Machine is designed for multiply the same holographic Image from a single holographic image to produce a big master shim as also it is quick process to make a big master shim. A thin single nickel shim of holographic image is pressed on top surface of a thermoplastic material (Poly Carbonate Sheet) as programmed by computer X & Y axis and heated electrically. X-Y step and repeat system allows the machine to operate automatically. After the above process we will get the thermoplastic material (sheet) with full of holographic Images as desire no. of single hologram. Now after some chemical process we will put this thermoplastic material (sheet) in to a electroforming Tank and will get the main master Nickel Shim. 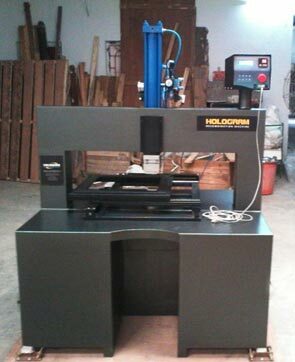 The Hologram Recombining Machine is designed for creation of Narrow Web / Wide Web diffraction pattern shims for embossing. Pulsed energy embossing from Nickel Shims into a thermoplastic surface, enables high fidelity replication of surface relief holographic and diffractive information. The recombining system is available as a stand along unit or in combination with holographic origination and production equipments. The below mentioned specification are for Model: HOML-DMR-10. Custom machines are available for specific applications.